In stock 53 items in stock. 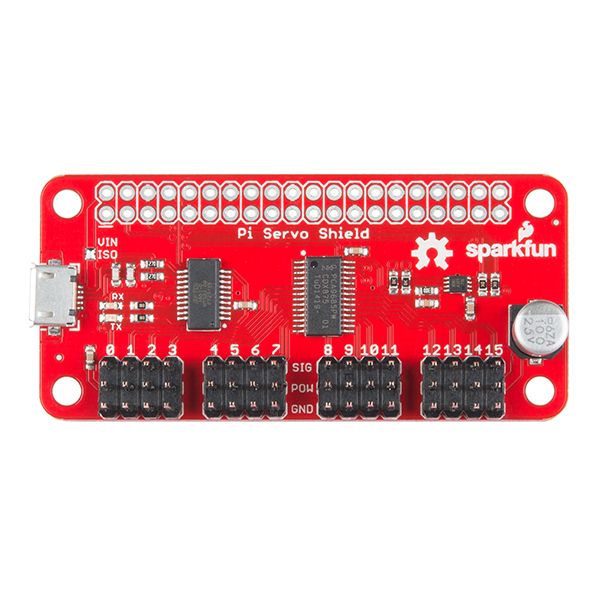 The SparkFun Pi Servo HAT allows your Raspberry Pi to control up to 16 servo motors in a straightforward and uncomplicated manner via an I2C connection. Thanks to its I2C capabilities, this PWM HAT saves the Raspberry Pi's GPIO, allowing you to use them for other purposes. Additionally, the Pi Servo HAT adds a serial terminal connection, which will allow you to bring up a Raspberry Pi without having to hook it up to a monitor and keyboard. 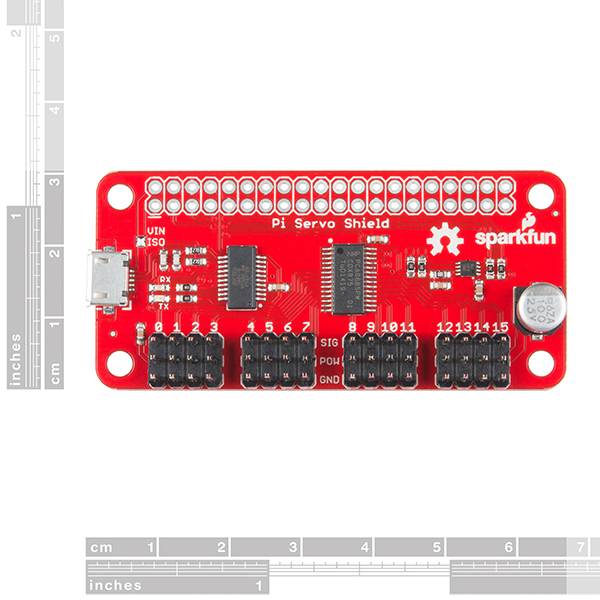 Power to the SparkFun Pi Servo HAT is supplied by a microUSB connector that can be used to power the servo motors only, or to power the servo motors as well as the Pi that is connected to the HAT. This USB connector can also be used to hook up the Pi via serial port connection to avoid having to use a monitor and keyboard for setting up the Pi. To supply power only to the servo power rail (and not the Pi's 5V power rail), you just need to remove a small blob of solder on the isolation jumper. Doing this allows you to drive heavier loads coming from multiple or larger servos. Each of this HAT's 16 servo motor pin headers has been spaced out the correct distance from the others to make it easier to attach your servo motors. They are pinned out in the proper order for most hobby-type servo motor connectors. The Pi Servo Hat is the same size and form factor as a Raspberry Pi Zero and Zero W, but it can also operate with a regular Raspberry Pi. 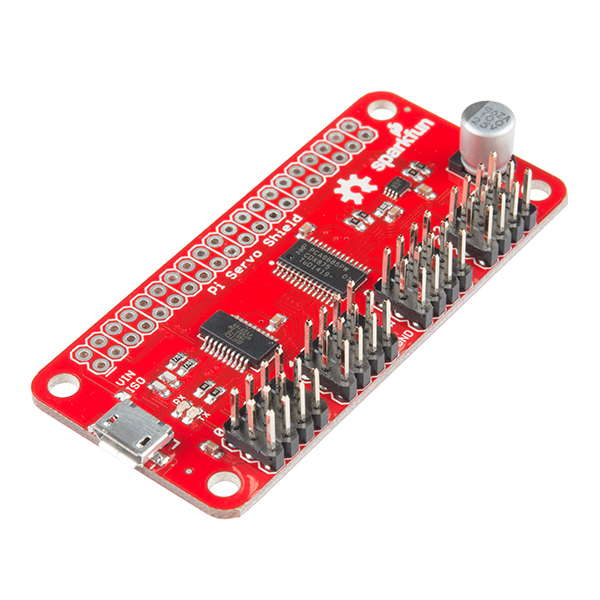 Note: This HAT does not include headers to connect to a Raspberry Pi, those will need to be purchased separately. We recommend the 2x20 "tall" headers. Use this homemade Arduino project to pick and place objects using a servo motor. Skill Level: Competent - You may need an understanding of servo motors and how to drive them. Additionally, you may need some fundamental understanding of motor controllers. 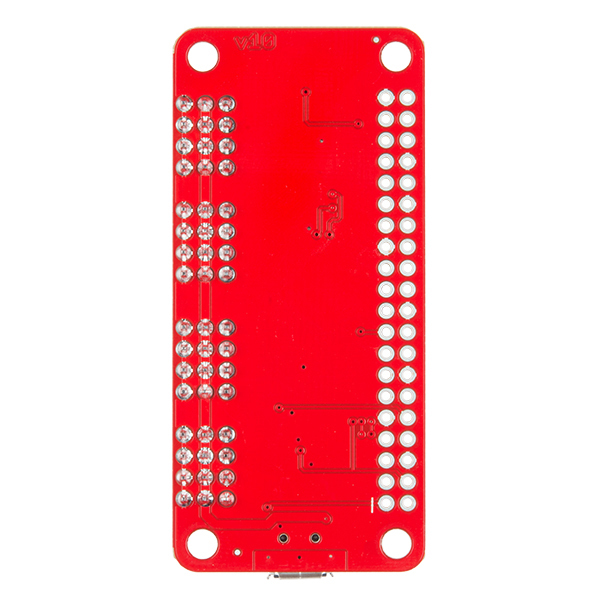 Does anyone know if the Adafruit Python PCA9685 Library will work with this? I don't see why not. They're both based on the same chip and they operate from the same principle. Awesome, thanks for the quick reply! Can we change the address and use more than one to drive more servos? I am interested in the same. After looking at the schematic, and board, I think the address pins are all left floating. I purchased a couple with the same intent and plan on soldering a wire wrap wire to the address pins so I can test this out. I wish the design would include a spot for a SMD DIP Switch or Jumper Block on the back, where there looks to be plenty of room, to assign the address more easily! I'm driving 4 large servos from the sparkfun servo hat off a pi3b+. I've removed the solder on the hat. I have powered the Pi and the hat with separate 5v 2.1A usb power supplies. A green light appears on the hat, I'm using python and get the error on the line (bus.write_byte_data(addr, 0, 0x20)). Error: IOError [errono 121] Remote I/O error. Any ideas? I've treid with only pins 1-8 connected from the pi to the hat (jumper leads) and only the sda/scl connected. I get the same error both times. Can someone do a tutorial on removing the solder and which wires need to be connected to the pi at a minimum via jumper leads? I am attempting to use this with servos that are standard size (though they are high torque..), and it seems like the current draw is still too much for this board when I've removed the blob of solder to have all power going to the servos. I have no problem using multiple micro servos. Is there a way to supply additional power to the board to deal with this? How many servos are you attempting to drive? Can you pipe in power directly via one of the unused servo power pins? That'd be my solution. To supply power only to the servo power rail (and not the Piâs 5V power rail), you just need to remove a small blob of solder on the isolation jumper. Doing this allows you to drive heavier loads coming from multiple or larger servos. How much load requires a separate power supply? If I were using a servo larger than the ones that came with the kit, or more than the two that came with the kit, I'd look at an additional power supply. Good thought. We are currently updating all aspects of our product pages and we'll soon have a fix for this. Until then I'll add a note. Thanks for the heads up! sort of working -- but not well Buyer Beware! I bought this board to control an x-y servo stack to move a raspberry pi camera around (pan-tilt) by remote control. So far what I have seen is a mixed bag. I have been able to control individual servos from the PI (these are small 9 gm servos) but not with the precision or finesse I was expecting. When two servos are connected I get quite a bit of random movement that seems to be related to electrical noise on the power bus. I have powered the unit both from the sparkfun board's micro USB connector as well as the one on the Raspberry Pi Zero W. In both cases I get lots of random movement and in the former case I also have periodic crashing of the Pi. I'm thinking that the only way to get this board working right is to separate the 5 volt power between it and the Pi and probably greatly increase the amount of filtering on the supply to prevent high frequency noise from influencing the servos. When the above issues are combined with the very poor build quality of the pan-tilt assembly that was sold with it, I find a lot of room for buyers remorse. The mechanical connections between the servos and the plastic housings included are so poor that I doubt the pan-tilt mount can be made to function for more than a brief "test bench" demonstration without breaking or stripping out the screws used to attach servo arms to the plastic housings. In fact, the lower (pan) element cannot be interfaced to the servo with the arms provided as they don't match either the instructions or the molding of the plastic housing. This means that in order to even test the device I had to do significant hacking of the hardware of the kit. Not classy at all. Perhaps at some point I'll be able to make use of it but the amount of work to be done just to get the kit to function has sent me down the path of multiple fixed position cameras for now.